Saints Louis and Zelie Martin, the parents of St. Therese of Lisieux, were natives of the department of the Orne in the region of Normandy, in northern France, and spent their marriage in the town of Alencon. After his wife's death, Louis moved to Lisieux, in the department of Calvados in another part of Normandy. Pilgrims who come in search of the Martin family almost always focus on northern France. Yet, by a twist of fate, St. Louis Martin was born and baptized in Bordeaux, a city in the department of the Gironde in southwestern France, not too far from the Spanish border. Bordeaux is more than three hundred miles from Alencon. captain pierre-francois martin, st. louis martin's father, and marie-anne-fanie boureau, st. louis martin's mother. no portraits of them as a young couple are known to have survived. Louis’s father, Pierre-Francois Martin, was conscripted into the French Army on August 26, 1799 at age 22. Although he did not join the army voluntarily, he had a long and distinguished career in the military. He became a corporal in 1800, a sergeant in 1804, a lieutenant in 1813, and a captain in 1816. In 1816 he was stationed in Lyons, where he became a close friend of the family of another captain, Nicholas Boureau, also a career officer. In this way he met Captain Boureau’s daughter, Anne-Fanie Boureau, then 16. Although Captain Martin was 23 years Fanie’s senior, her family did not object to the marriage. But, as Captain Boureau had suffered financial reverses and could not give his daughter the dowry necessary for an officer’s wife, Captain Martin himself supplied the dowry. On April 4, 1818, when Fanie was eighteen and Pierre-Francois 39, they were married in Lyon. The religious ceremony took place three days later. Why was Fanie living in Bordeaux? Pierre-Francois moved about constantly with his regiment. The young couple’s first child, Pierre, was born on July 29, 1819 at Nantes, where they were then living. This child died in a shipwreck while still very young; the exact date of his death seems unknown. He was Louis Martin’s only brother. Before Fanie and Pierre-Francois left Nantes, their oldest daughter, Marie-Anne,was born on September 18, 1820. On January 16, 1821, Captain Martin arrived at Bayonne and joined the 19th light infantry, then one of the most mobile regiments in the country, and for several years he moved about often. His family could not follow him as he went from one assignment to another, so his young wife and children lived in Bordeaux (in southeastern France, not too far from the Spanish border). Bordeaux in the 19th century. courtesy of st. eulalie's church, bordeaux. Why was Captain Pierre-Francois Martin in Spain when his son was born? In November 1821 Captain Martin was sent to Toulouse; the next year he spent several months in Perigeux. The 19th light infantry participated in the expedition to Spain led by the duke d’Angoulême in order to establish Ferdinand VII on his throne. On October 18, 1822 Captain Martin was at Saragossa in Spain to take part in the blockade of Lleida, which the French did not penetrate until November 4, 1823. It was during this action that he received word of the birth of his second son, Louis, in Bordeaux on August 22, 1823. But Captain Martin could not return to France. He was sent to Barcelona, and then to other parts of Spain, and on August 20, 1824, was made a knight of the royal order of St. Louis by the decree of Charles X. t could have been several years after little Louis was born before Captain Martin saw his second son. [Note; Most of this information has been translated from Louis et Zelie Martin, by Thierry Henault-Morel (Paris: Editions du Cerf, 2015), pp. 20-21). If you read French, I strongly recommend this book, which is meticulously researched and full of details never published before]. So Fanie, at the age of twenty-three, was making a home in a strange city for her two little ones, Pierre, who was four (if he still lived) and Marie, almost three, while she waited for Louis's birth. 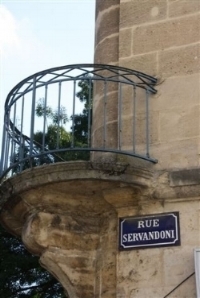 Their home was at 3 rue Servandoni in Bordeaux. Louis Martin was born at 3 rue Servandoni. I hope a marker will be erected to mark the street where he was born. A street view of the rue Servandoni, where Louis Martin was born. The site of his birth is near the lower right of the photo. 1 rue Servandoni, next door to the birthplace of Louis Martin. Unfortunately, a modern store now occupies the site of his birth house. These nearby houses, dating from the 19th century, resemble the house at 3 rue Servandoni in which Louis Martin was born. His birth house has been razed or replaced with a new facade, but you can imagine his young mother, awaiting the birth of her third child, looking after two young children in one of these houses while her husband was away at war. I thank Yves and Lai Ping Cogoluegnes Kong for the gift of these photographs.